This is your last chance in 2010 to own The EzineArticles Formula and become a student of this article writing and marketing training system. Complimentary five weeks of access to EzineArticles Premium membership – a $121.25 value! As an instructor for The EzineArticles Formula, it was exciting to start interacting with students/owners this past week for Modules 1 and 2. Marc, Chris, Penny and I have been answering each and every question that is asked. The questions are coming in greater volume now with each and every student that takes advantage of this great opportunity, which inherently creates even more value to this training system. Modules 3 and 4 were released on Tuesday. Right now, students are discovering all about creating article titles that will maximize their traffic results, and how to generate quick article ideas that will attract their ideal customer. You can be sure that is going to bring about some great dialogue. Coming up with great ideas and content for your articles that will drive traffic to your website or blog can be a challenge as an author. Here’s a small sampling of tips you’d be learning right now inside of The EzineArticles Formula. These tips will help you generate a huge family of traffic generating articles. The key is to never have the mindset to create just one article, instead create sets of articles. Create an Article Set by Topic or Subtopic: Pick a topic and then create at least five subtopics to write about within that one topic. For example, if you wanted to write about cod. You could write about what to look for when picking out a fresh piece of cod, how to prepare it, killer recipes, the health benefits of eating cod, or even wine that would go well with cod. The possibilities are endless. Create an Article Set by Style of Writing: Write five articles using the question and answer approach, debate approach, or the bullet point approach. The great thing about the bullet point approach is that you can take each bullet point and make a separate article out of it. Create Article Sets Based on Customer or Prospect Frequently Asked Questions: Questions from customers or prospects give you the insight as to what people want to know. It will allow you to give your clients and prospects the exact information they are looking for. 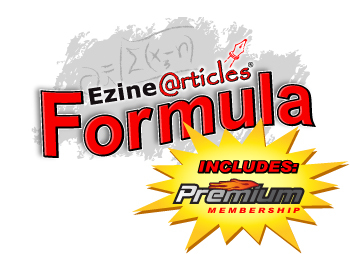 Why should you take advantage of your last chance to own The EzineArticles Formula in 2010? Today is your last chance to take advantage of this opportunity in 2010. If you are looking to get started with this proven marketing method, or if you want to take your efforts to new heights, don’t miss your chance! Nice, Write five articles using the question and answer approach, debate approach, or the bullet point approach. The great thing about the bullet point approach is that you can take each bullet point and make a separate article out of it.